Today the name of Isaac Newton Lewis is little known outside of firearms circles, but he exerted a major influence on aerial combat. In 1911, Colonel Lewis, a U.S. Army ordnance officer, adapted a machine gun design patented by inventor Samuel McLean. With a soldier’s eye toward utility, Lewis worked with the Automatic Arms Co. in New York to simplify the original design as a workable weapon. Light and potent, it was a revolutionary design. The Lewis Gun was gas operated, firing .30 caliber rounds at 2,500 fps or more, typically cycling at 550rpm. The air-cooled design was augmented by a finned barrel shroud to reduce heating. The Lewis’ feed system was perhaps unique. Rather than relying on springs as with other magazines, the Lewis drum (47 or 97 rounds) employed a mechanical arm that fed cartridges into the breech, operated by the recoiling bolt. 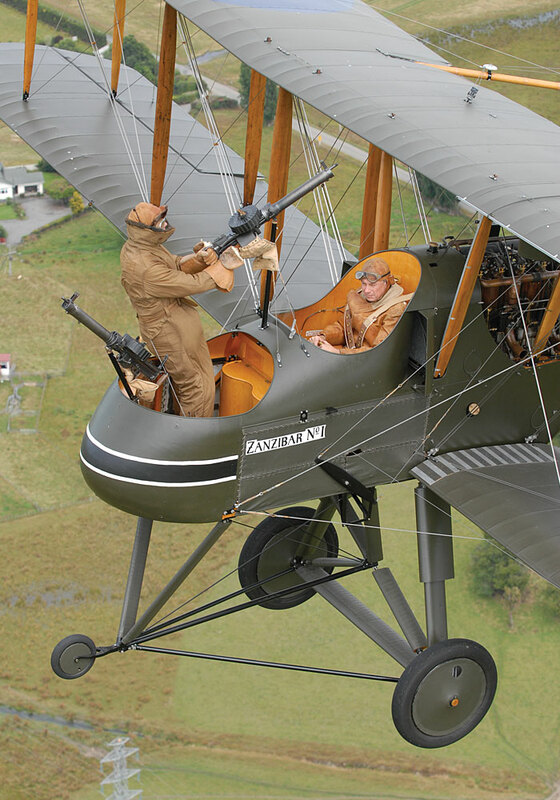 A Lewis was the first machine gun fired from an airplane. In June 1912, Capt. Charles Chandler fired on ground targets while chauffeured by Lt. Roy Kirtland in a Wright Model B biplane. Lewis further modified the weapon, producing a 1914 version weighing just 28 pounds empty, 33 loaded. Nonetheless, the U.S. Army never officially adopted the gun, reputedly due to a 1911 argument Lewis had with the vindictive chief of ordnance, Brig. Gen. William Crozier. Lewis retired in 1913, leaving Crozier to inflict the egregious French Chauchat upon the doughboys of 1918 — arguably the worst automatic rifle of all time. However, the U.S. Navy and Marine Corps accepted the Lewis Gun in limited numbers. Britain officially adopted the Lewis in October 1915. During the Great War, the type was produced by BSA in England (.303 caliber) and by Savage Arms in the United States (.30-06). Production was critical in an industrial-based war of attrition, and the Lewis’ relatively simple design afforded an advantage over the heavier, costlier Vickers. Because it fired from an open bolt, which enhanced cooling, the Lewis was unsuited as a synchronized aircraft gun like the Maxim and Vickers. But the Lewis’ light weight endeared it to first-generation military airmen. In 1915, Capt. Lanoe Hawker (later killed fighting Manfred von Richthofen) mounted a Lewis on the left side of his Bristol C Scout, firing at an angle to clear the propeller. Though an inadequate arrangement, it pointed to the future. Pusher aircraft such as the Vickers F.B.5 “Gun Bus” and the Airco DH-2 mounted forward-firing Lewis Guns versus the Fokker Eindecker series with Maxims firing through the prop arc. The other option for avoiding the propeller was to mount the Lewis on a biplane’s top wing. British, French, Belgian, Italian, and Russian aircraft used Lewises in a fixed mount until the allies produced synchronizer gear. However, the mount on the upper wing required a pilot to stand in the cockpit while reloading, posing a dreadful risk. Engaging a German aircraft in May 1915, Lt. Louis Strange stood up to change drums and lost control of his Martinsyde. The biplane rolled inverted, leaving Strange dangling from the stubborn Lewis drum, the only thing between himself and eternity. Other pilots were spared Strange’s ordeal thanks to Sergeant R.G. Foster of No. 11 Squadron RFC. In early 1916 he invented the sliding rail for wing-mounted Lewises that bore his name. The Foster mount was used on Nieuports, S.E. 5s, and other aircraft, permitting reloading while the pilot remained seated. It also allowed Allied fliers to approach unwary enemies from below, unlocking the gun, and firing into the target’s belly. Lewises were widely used as single and twin-mount guns on Allied observation and bomber aircraft. The types were as varied as DH-4s, RE-8s, Bristol Fighters, Salmsons and Breguets, and Handley-Page 0.400s. Accounts vary, but at war’s end probably some 200,000 Lewis Guns had been produced in the U.S. and U.K; about two-thirds for aircraft use.